Unique A-frame home with fruit orchard minutes from Black Rock Marina. White Tail Orchard is a unique A-frame mountaintop cabin that allows you to truly escape from the busyness of daily life. 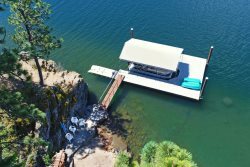 Situated on a large plot of land overlooking Rockford Bay on Lake Coeur d’Alene, you’ll enjoy plenty of forest to explore, a grassy area perfect for a picnic and even a fruit orchard. Inside you’ll marvel at the views through the floor to ceiling windows in the home’s main living area. In the evenings, the wood-burning rock fireplace and the cozy leather furniture create a wonderful area to curl up and chat. On the other side of the fireplace is a table with seating for 4. Head into the bright fully stocked kitchen and you’ll discover everything you’ll need for easy meal preparation. This lower level offers the home’s bathroom with a shower/tub and a bedroom with a twin bunk bed. You’ll find the master bedroom with a queen bed up a short staircase on the upper level. There’s also an upstairs north facing balcony you can step out onto first thing in the morning to smell the fresh mountain air. On the opposite side of the home is the large south facing deck with a BBQ that’s fantastic to relax, take in the view or even enjoy a meal. When you’re ready to get out and explore the area, you’ll find yourself only a couple of minutes from popular family-friendly Shooters Bar & Grill and Black Rock Marina. Plus, you’ll be 25 minutes from downtown Coeur d’Alene’s shopping, dining, entertainment, public beaches and parks. Get away from it all in this adorable A-frame with a rustic feel and ample amenities.